A madman Ford nut is hand-building an incredible Hummer H1 replica on the bones of a junker Ford F-150. The full scope of this fabrication fest can only be appreciated in the huge gallery below. We've only ever seen this level of insane skill before in the basement-built Lamborghini Countach of Ken Imhoff, but craftsmanship and the mid-level insanity of the builders is all these vehicles share. This H1 isn't some surplus rebuild or fiberglass kit, it's all-steel, hand fabricated to a near-military spec level of quality. The frame comes from a rough 1987 F150 4x4, the rear axle was pulled out of a E250 van, the engine is a monster 7.3 liter Powerstroke diesel from a shuttle van, and pretty much everything else is the result of a press-brake and and whole lot of welding. 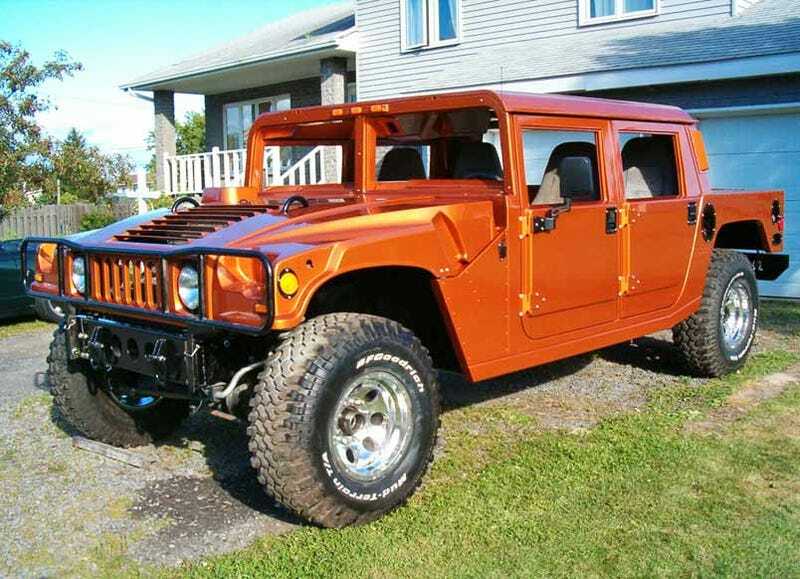 The result has been dubbed the Hummer H150. We were a little worried, about half-way through the 48 pages of forum details on FullSizeBronco.com where he admitted his wife would be given the choice of paint scheme and she picked out a two tone white and grey with a tribal line in the middle. Thankfully she came to her senses and a lovely orange was chosen instead. Though the truck isn't quite done yet, a whole lot of the major work is through. The body electronics just got the test and transmission has been sourced, so after buttoning up the powertrain it'll be ready for a maiden run. This build has taken some five years thus far, but considering how far this guy has come the last few steps are practically child's play.